Canadians produced over 720 megatons (Mt) of greenhouse gases (GHGs) in 2015. That’s a lot of gas: 1,587,600,000,000 pounds of it, to be precise, or as much 120,000 fully loaded freight trains. 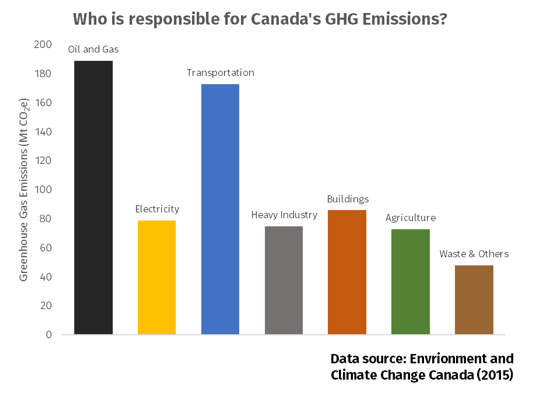 In this post, we dig deeper into Canada’s GHG statistics, deciphering some of the jargon and making sense of the data. 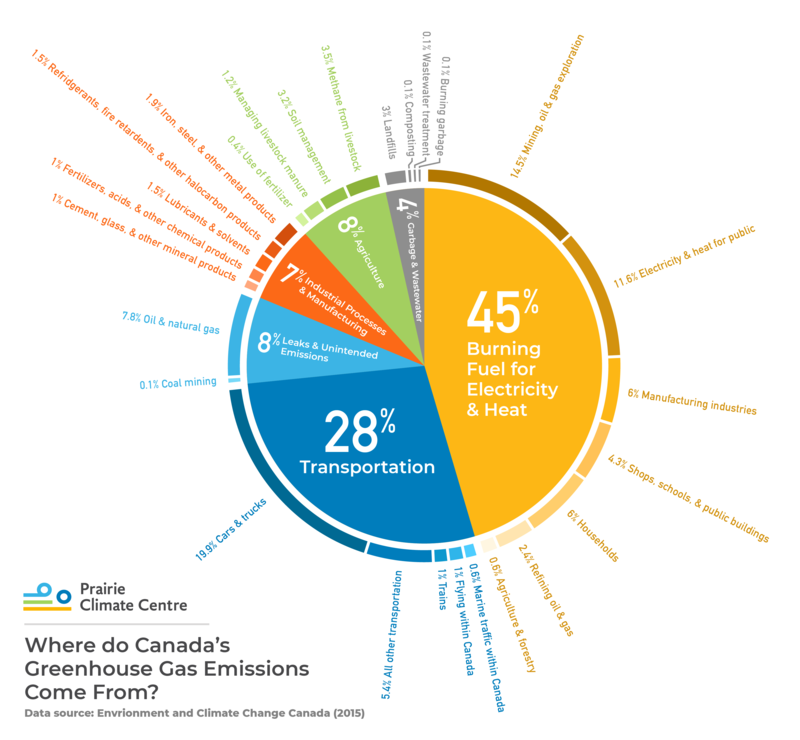 The oil and gas industry is Canada’s leading GHG emitter. Emissions from the transportation sector are a close second. Since GHG recordkeeping began in the 1990s, some economic sectors in Canada have managed to reduce their carbon footprints. Electricity generation, for example, has managed to cut emissions, as new technologies and an increase in renewables have drastically cut our reliance on coal. The graph above told us which sectors produce the most greenhouse gases. It very clearly shows that the oil and gas and the transportation sectors are the largest contributors to national GHG emissions. But these numbers can be further pulled apart to better show when and how these gases get released into the atmosphere. By far the largest source of GHG emission in Canada comes from the combustion of fossil fuels to make energy, including heat and electricity. Mining, oil and gas, and manufacturing are collectively responsible for the largest slice of this pie, followed closely by houses, shops, schools and other private and public buildings. It is important to note that the total emission from the oil and gas sector cover multiple categories, meaning these numbers only tell part of the story. Moving towards more power-smart building designs can help greatly reduce GHG emissions, including the adoption of more passive solar heating and cooling systems. At the household level, even small steps like choosing energy efficient light bulbs and installing a smart home-thermostat can add up to make a difference. The movement of people and goods across Canada’s wide and diverse landscape is the second-leading source of GHGs. Here, cars and trucks—including personal vehicles and commercial vehicles—share the largest slice of the pie. Electric and hybrid vehicle technologies can help lower emissions, but an equally important step would be towards building more bike paths and designing better public transportation routes. The emissions that come from marine and aviation traffic may, at first blush, seem smaller than expected; however, it is important to note that the Government of Canada does not count the emissions released during international trips. In Canada, a lot of energy goes into growing food. Very large volumes of fuel and fertilizer are used to run farms, and both contribute to national GHG emissions. It is important to note that the actual manufacture of fertilizers is counted under “Industrial Processes and Product Use” and so the numbers here only represent the emissions that are released when fertilizer is applied to a field. Industrial scale livestock operations also produce large volumes of GHGs. However, an often-unappreciated source of GHGs comes from outdated and unsustainable soil management practices. Agricultural emissions can be significantly lowered by using zero-tillage methods and focussing on soil health regeneration. Similarly, there are many techniques farmers can use to lessen their reliance on fertilizers. The fourth largest source of GHG emission in Canada comes from so-called ‘fugitive emissions,’ or greenhouse gas emission that are released into the air as an unintentional by-product of industrial activities. This includes flaring, venting, leaks, and spills. Virtually all fugitive emissions are released by the oil and natural gas sector. Many of the products we use everyday have hidden GHG footprints. Take cement: the production of cement requires a lot of heat energy, but its GHG footprint gets doubled in size because of a chemical reaction that takes during concrete formation. Manufacturing nitrogen fertilizers also uses a surprisingly large amount of energy, and once applied to a field these fertilizers mix with the air to produce even more potent GHG emissions. A lot of chemicals and substances that are harmful to human health, including fire retardants, solvents, and acids, also have large GHG footprints. This means that as we reduce our GHG emissions, we also stand a good chance of improving our health. It is important to note that the emissions released to create products later imported into Canada are not counted here. A surprising volume of GHGs come from landfills and wastewater treatment plants. When garbage breaks down deep within in a landfill it produces methane, a powerful greenhouse gas. Reducing waste is an obvious step towards reducing these emissions; however, employing new technologies like landfill-gas capture also help. Here’s some food for thought: overall, total GHG emissions per GDP and per person have declined since the 1990’s, despite the fact that Canada’s economy and population have grown since then. This means that the steps we’ve taken to become more energy efficient and environmentally responsible have actually worked. We still have a long way to go before we will be on track to meet our emissions targets laid out during the 2015 Paris Negotiations; however, with a new national carbon pricing plan in the works, exciting new developments in renewable energy and electric vehicles, and a greater understanding and appreciation of climate change among the public, it seems like now is Canada’s moment to show the world what climate leadership can be. One megaton equals one million metric tons. One metric ton is 2,205 pounds. Here, we assumed that a fully loaded freight train weighs approximately 6,000 tons.